I've done this in a knock of kettle heaps of times and it always turns out great. Butterfly and Marinate as per the recipe and do a chimney full of beads or charcoal in a heap on one side for an indirect cook with a strip of foil to protect the bird from the heat at the closest point. I cook to temp and it is always a winner. Did 2 kilos of drumsticks for the eldest sons 14th and his mates demolished them. will give this a go for sure! This is the setup I use when I do a chook. In the picture its a different recipe but the setup is always the same. Cooks faster than whole and stays nice and moist. Can give it a quick finish straight over the charcoal for a few grill marks and a bit crispier skin too. And put the lid vent over the top of the chook to draw hot air over it then out. Wow that's awesome! Will definitely give this a try! although it wont be just 1 bird ...it has to be 2! If you want extra smoke get a $10 smoking tube from eBay. 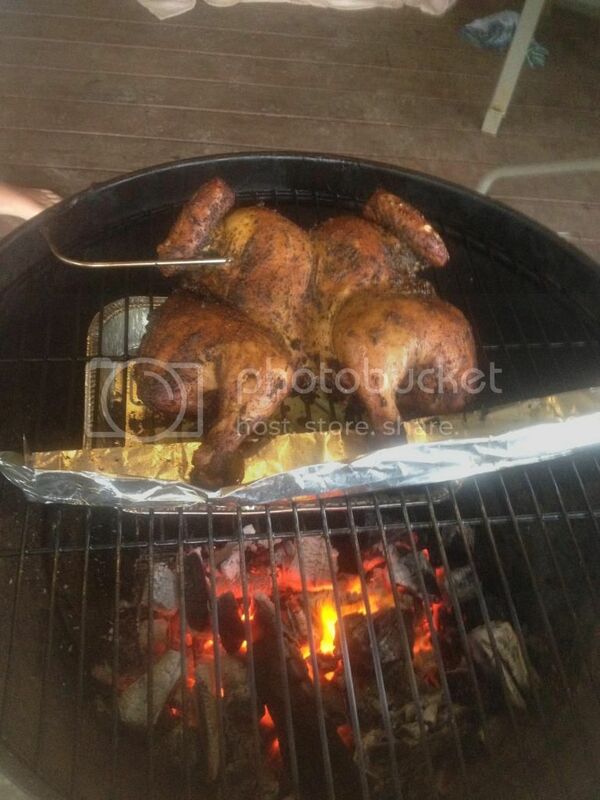 Anyway to do this cook on a weber Q? Just do it how you would normally do a roast chook in the Q, I don't have one so can't comment on technique. Grab a smoker box to create the smokiness but you can get away without it.